My readers and class participants are always asking for healthy dessert ideas. My favorite healthy desserts are ones with fruit as the star, recipes like poached pears, strawberry salad or strawberry rhubarb crisp. This baked grapefruit recipe was suggested to me by several of my readers in the comments of the grapefruit giveaway I hosted a few months ago. I had never heard of baking grapefruit before, and emailed many of you for details. I gave it a try and have become someone addicted. In fact it’s killing me that grapefruit season is ending! These are simple to make and delicious for dessert, a snack or even breakfast. Here’s an infographic on How to Bake Grapefruit to show you just how easy it really is! Easy right? Baked grapefruit is juicy and sweet and hot and I can’t believe I’ve never tried baking citrus before! Hmmmm, maybe a lime tart is next on my list? Or maybe I should wait for citrus season to return. Right now I’m really looking forward to cherries. Next week I’ll show you all the little green ones on our trees! Have you ever baked grapefruit? Am I the only baked grapefruit noob here? Drizzle the cut halves with the honey and sprinkle with cinnamon. Bake 10-15 minutes. 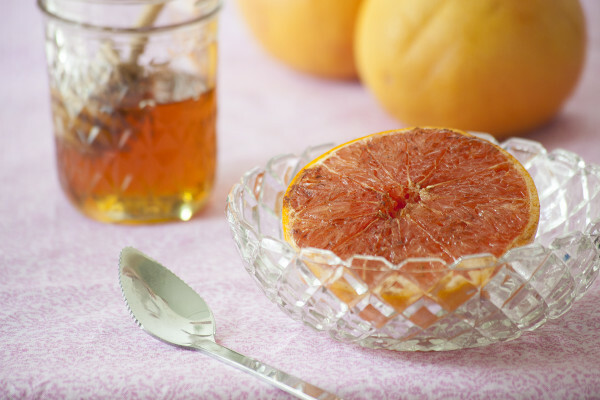 Serve hot with grapefruit spoon. Approximate cost/serving: In season I can get a grapefruit for under $1. So at the most this costs me fifty cents a serving. Vegetarian/gluten free: Yes, and easily vegan if you swap the honey for maple syrup!